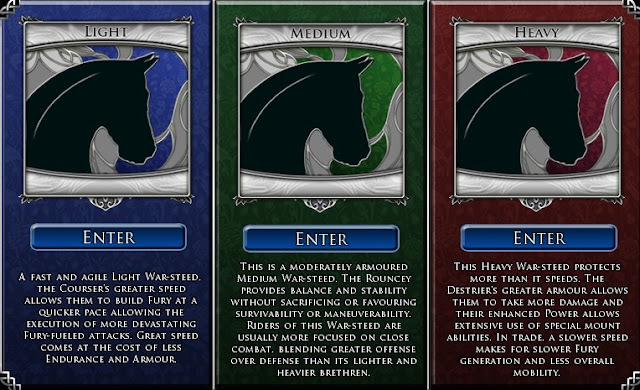 This week, I am going to do a special multi-part post on Warsteed Traits. For sure, my best hope to optimize a system is when I understand the variables involved. 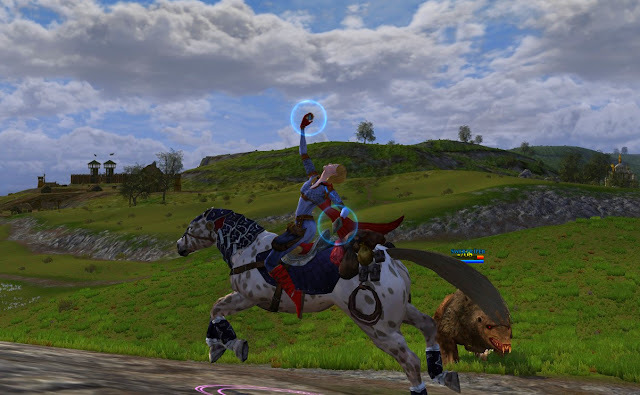 For my first week on a warsteed, when I wasn’t playing with cosmetic options (rohan-warsteed-cosmetic-looks) or flying (flying-warsteed), I was zipping around button-mashing and randomly picking a horse type and traits that felt good at the time. Now it is time to actually read the trait information and start trying to make some reasonable choices. There are several factors that are going to work together to make a very potent warsteed. Those are Horse type, Warsteed traits, Bridle legacies, Bridle Relics, and Warsteed skills. 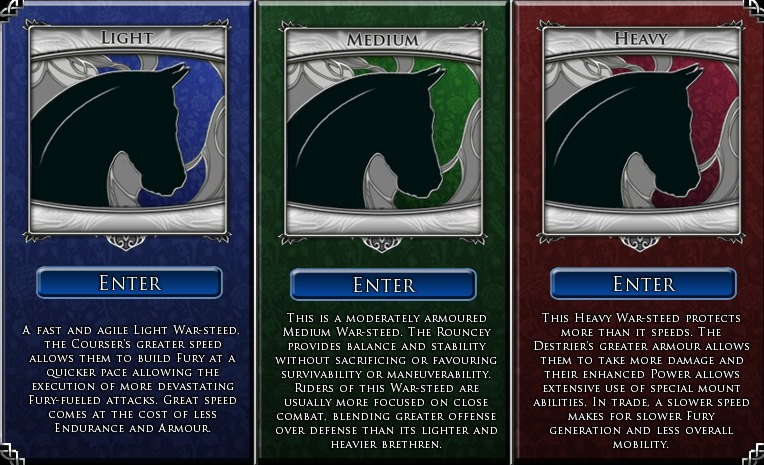 For this set of posts, I will focus on Horse type and Warsteed traits. As a Runekeeper, I will write what I see. Occasionally, there will be a distinct RK flavor, but I will try to make it useful for non-RKs. The first obvious thing to see is there are three horse types: Light, Medium, and Heavy. Here is the first screen you see when you get a Warsteed. You have to decide which type you prefer. You can always go back and change it at any time without losing any “work” you put into it. You just reassign points and it costs a little gold. Those three horse types have available “traits”. The trait sets include (1) Stats buffs, (2) a Red trait tree line called Red Dawn, (3) a Blue trait tree line called Rohirrim, and (4) a Yellow trait tree line called Riddermark. Do not confuse the fact that there are 3 Trait Discipline trees and 3 Horse Types. These Disciplines are not tied to the horse type directly. Each discipline is just a set of traits that is available for each horse type. There are some similarities between the three horse type’s trait sets. I will start with an overview comparing similar Traits by Warsteed type. The next parts will go deeper into what all the Traits do. Red Dawn is set up to do damage to the Enemy. It has mastery, critical, and finesse bonuses, and focuses on ways to make attacking easier. With whatever horse type you use, the effect is the same: DPS. For Runekeepers, this trait line is the Fire traits. Rohirrim is all about protection. The traits do different things, but the focus is on better mitigations, resistances, block/evade/parry, warsteed morale and power return. For Runekeepers, this trait line is Healing and the class specific traits focus on heals. Riddermark traits focus on Speed for the first half. The deeper traits work on enemy positioning, pick up a Fellowship trait, and focus on the “pound it” damage. “Pound it” means that the trait line picks up things like “Trample” (which we will get to) and bonus criticals. For Runekeepers, this trait line is the Lightning trait set. There are a lot of potential combinations! In Parts 2 – 5, I will break the traits down by Warsteed and discuss each trait. Tune in tomorrow-ish for the next installment. Update 11/05/12: Made a couple of tweaks to the numbers that didn't add up correctly. Update 05/22/13: Yellow line traits have been completely revamped and are more Class Specific now as of Update 11: Wildemore! Revamped table is forthcoming. Amazing work! Nice job on this post, can't wait to see the follow up posts. I'm fairly certain that the traits -- the names, at least -- are identical for each class. The major difference is in the final tier. The "capstone" usually applies a class-related effect to specific mounted class skills. Thanks for the segue into Parts 2, 3, and 4 which discusses the traits in more detail! Interesting that the heavy steed takes more points. Not much, but still. That is interesting isn't it? :) I would have thought each of the horses would have had the same number of points necessary in the trait lines. I had a friend double check the Heavy set to make sure that I can add, and the Heavy does have 1 more point worth of traiting. Go figure. Oh Dana. Thank you so much for this. War steeds confuse me still (although that may be due to my lack of time to play for a little while longer).